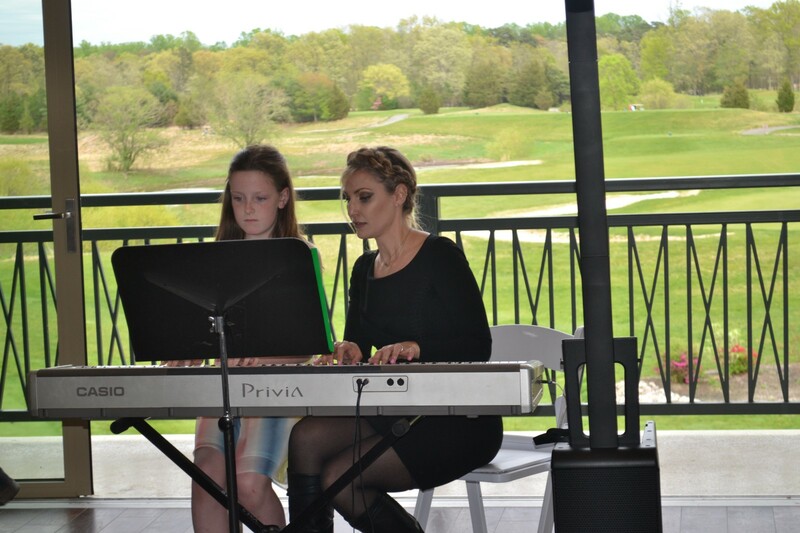 Ten-year-old Caroline Kilmer, a Pleasant Valley student, playing alongside her instructor, Gina Corso. One woman is on a quest to create a musical community in South Jersey. Gina Corso, a.k.a. Jersey Gina, and a 1999 Clearview Regional High School graduate, is a professional acoustic and electric violinist and music instructor from Mantua. With a violin first in her hands at the age of 2, Corso now portions her time between teaching private lessons and performing as a soloist, within a duo, quartet or as part of an orchestra. Last week, Corso held a recital for all the students and families she serves. “The idea behind Sunday’s student showcase is to bridge connect all of these separate communities based on our own interest in music as a hobby,” she said. Ten students gathered with their families at the Scotland Run Golf Course in Williamstown to showcase their developing skills. 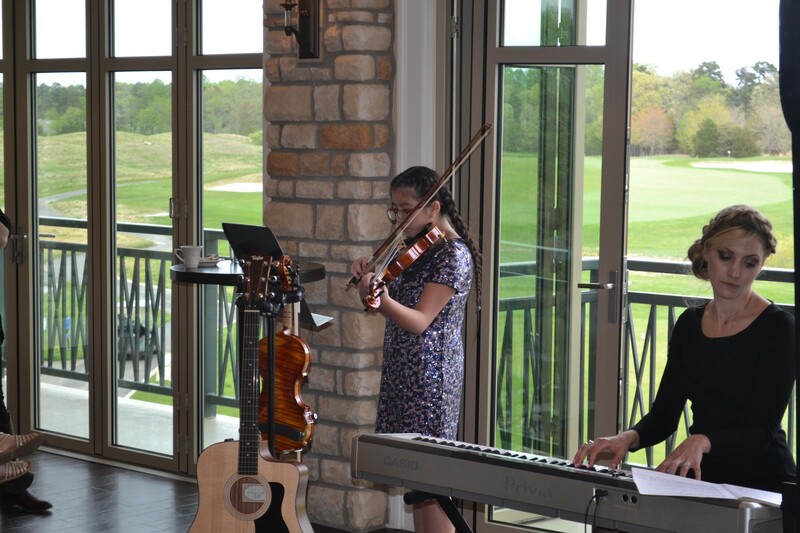 Vy Do, a Pleasant Valley student and violinist said she was not nervous to perform in front of the crowd last weekend. Caroline Miller, another Pleasant Valley student, said what helps make music enjoyable is Corso herself. Not wanting to hold a standard recital where students play a practiced piece and simply walk off the stage, Corso’s recital was meant to be part lesson. Available to the 80 people in attendance were cakes and auction items all donated by local businesses. To prepare these young artists for future performances, Corso first played a song with each student before allowing the young musicians to perform solo. “Every student up there was making mistakes but they got through it,” she said. Corso is no stranger to big crowds and having to disguise on-the-spot troubles. “All performances experience unexpected problems,” she said. While she enjoys the large crowds and even performing at corporate events and weddings, Corso said her most cherished aspect of her musical life is teaching the children. Vy Do, a Pleasant Valley student, wows the crowd with her violin skills at such a young age. “They keep me grounded, and I could never let them go,” she said. The larger tours prepare her to teach young musicians about performing in front of crowds; however, she said the imperative lesson is that music is a healthy exercise. “[Music] gives them a healthy hobby they can have for the rest of their lives. … You can put it down for a bit of time and go back to it. You want to fuel these hobbies,” she said. Through the hobby of music, Corso says healthy, beautiful communities can be built. Corso plans to hold more recitals in the future but has no dates set at this time. She just knows, “I want to do it again, but I want it to be bigger next time.” She also has no age limit for students she teaches. “Teaching is natural for me, I do not have to think,” she said. For more information about Corso visit http://jerseygina.com/.